The mayor of San Juan, Puerto Rico, Carmen Yulin Cruz, will visit the Pioneer Valley and make a stop on April 25 at Gateway City Arts in Holyoke to speak about the transformation of her city and Puerto Rico after the devastation caused by hurricanes Irma and Maria. Holyoke City Councilor Jossie Valentin, who volunteered as a relief worker in Puerto Rico for three weeks in November and organized the event, said she’ll be interviewing Cruz for a one-on-one conversation that’s free and open to the public, but has a capacity of 500 people. “We hope to be focusing not so much on what happened, which was covered quite a bit by the media in different ways, but where the island goes from here? From conversations about renewable energy to the steps that the island to not just rebuild, but transform some of the systems so that when the next hurricane comes around … the island is prepared as best as possible,” Valentin said. Earlier in the week, Cruz will deliver a keynote address to Mount Holyoke College students, staff, faculty, and alumni — an audience that’s anticipated to include 1,100 and 1,500 people. Valentin said Cruz’s visit to the Pioneer Valley wouldn’t have been possible without Mount Holyoke College, which has paid for all of Cruz’s expenses. She said she hand delivered a letter from Mount Holyoke to Cruz requesting for her to be a keynote speaker and she immediately accepted. “I asked her, ‘How long do you want to be in the area when you come?’ and she said, ‘Let’s try to make it a couple days so I can really spend time with the people of Holyoke and the college community from Mount Holyoke,’” Valentin said. Almost half the population of Holyoke is of Puerto Rican descent – one of the main reasons why it was important for the event to take place in the city, she said. Valentin, who knows Cruz personally, describes her as someone who’s passionate and hardworking. Valentin and her wife Myriam Quinones trained as Red Cross Emergency responders and spent three weeks starting in early November serving as responders. For Valentin, helping the people of Puerto Rico was personal — she has family in San Juan and grew up on the island from ages 7 to 17. 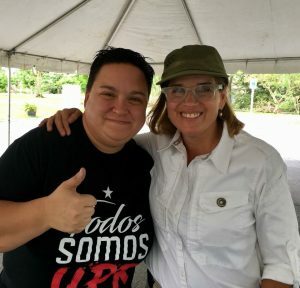 An Evening in Holyoke with Mayor Carmen Yulin Cruz will take place at 7 p.m. on April 25 at Gateway City Arts. Doors open at 6 p.m. The event is free, but limited to 500 attendees. For more information visit http://www.gatewaycityarts.com.